(June 15, 2018– BOSTON, MA) – NACA, the nation’s largest HUD certified non-profit housing and community advocacy organization, will help low to moderate income home buyers and others in the greater Philadelphia area take the first steps toward achieving their American Dream of homeownership during a special four-day free event June 21 – June 24, from 8:00 AM to 8:00 PM at the Greater Philadelphia Expo Center located at 100 Station Ave., Oaks, PA 19456. NACA’s Best in America Mortgage Program will be highlighted at the event. Homebuyers who purchase through the NACA program buy with no down payment, no closing costs, no points or fees and no PMI. Everyone receives a below market interest rate and perfect credit is not required. The interest rate can also be bought down to virtually zero. This is a truly unique opportunity for homebuyers to realize the dream of affordable homeownership and NACA services are free of charge. Thousands have attended previous Achieve the Dream events in Baltimore, MD and Newark, NJ. Achieve your dream of homeownership today, the NACA way. For documents needed and to register, go to www.naca.com or call 281-968-6222. Walk-ins are welcome. “Fighting for economic justice through homeownership and community action”. (Boston, MA – April 23, 2018) NACA, the nation’s largest non-profit HUD certified housing and community advocacy organization, believes the $1 billion fine levied against Wells Fargo is a positive step in correcting the bank’s predatory practices. This significant penalty, along with the current restrictions on their growth, sends an important message to Wells Fargo’s executives and board members that fundamental change needs to occur. Nevertheless, virtually none of the funds from the $1 billion penalty from the OCC and CFPB will be going to Wells Fargo’s consumers. The current government regulators are following the same practice as the previous administration of using the victims as a source of government funding. Since these are not victimless crimes, the current administration needs to set a new path of utilizing penalties to benefit current and future customers. 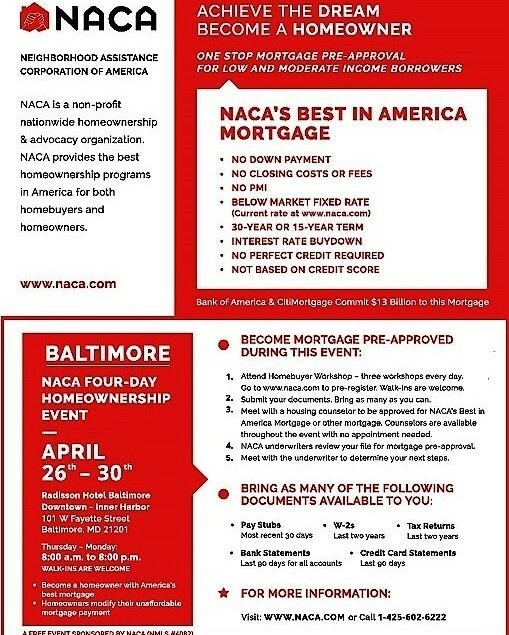 About NACA (www.naca.com): NACA is the largest and most effective organization in modifying mortgages and provides the best mortgage in the country. NACA has more than two million members and 47 offices nationwide. NACA CEO Bruce Marks was named Bostonian of the Year for 2007 because of his work in getting the major lenders and servicers to modify home loans for borrowers. See Bostonian of the Year. Mr. Marks has also testified before Congress on numerous occasions including September 12, 2000, being one of the only people to sound the alarm on the pending mortgage crisis. BALTIMORE ACHIEVE THE DREAM EVENT OPENS THURSDAY! (BALTIMORE, MD) – The nation’s leading homeownership organization announces the most effective and unprecedented home buying event available to would-be homeowners. The Neighborhood Assistance Corporation of America’s (NACA) Achieve the Dream tour kicks off at 8am Thursday, April 26 at the Radisson Hotel Downtown Inner Harbor, 101 W Fayette Street in Baltimore. Thousands of prospective homeowners from the Baltimore-Washington metropolitan area are expected to attend the event for a chance to get a same day mortgage qualification. The Achieve the Dream event will run five days from 8am through 8pm, ending Monday, April 30th. The Achieve the Dream event is a one-stop mortgage operation with workshops, one-on-one comprehensive counseling and underwriters to approve/pre-approve borrowers for a NACA mortgage. NACA’s mortgage is unique as it features no down payment, no closing costs or fees and no private mortgage insurance. Everyone receives a below market interest rate and perfect credit is not required. The interest rate can also be bought down to virtually zero. Bank of America and CitiMortgage have committed over $13 billion dollars to this mortgage program, and participants can buy homes anywhere in their area. The cost of significant repairs or renovations can also be built into the mortgage. Single and multi-family homes and condos are all eligible. NACA, the nation’s largest HUD-certified non-profit organization, is expected to counsel thousands of Baltimore-Washington area residents during the event. Most expected to attend will be first time home buyers, with low and moderate-income. “Affordable housing is an issue in the DC, Maryland and Virginia areas, especially for working people,” said NACA CEO Bruce Marks. “Our Achieve the Dream events open the floodgates to those blocked from the dream of affordable homeownership. Many will be qualified for a NACA mortgage during the event and many more will be on the road to homeownership and the building personal financial security”. For a list of required documents individuals should bring to the event and to register, visit www.naca.com or call (281) 968-6222. Walk-ins are welcomed. About NACA (www.naca.com): The Neighborhood Assistance Corporation of America (NACA), is one of the largest HUD certified counseling agencies with more than two million members and 47 offices nationwide. NACA is the largest and most effective organization in modifying mortgages and provides the best mortgage in the country. NACA CEO Bruce Marks was named Bostonian of the Year for 2007 because of his work in getting the major lenders and servicers to modify home loans for borrowers. See Bostonian of the Year. Mr. Marks has also testified before Congress on numerous occasions including September 12, 2000, being one of the only people to sound the alarm on the pending mortgage crisis. After April 18th, tax returns are required to be submitted to all files in the NACA Purchase Program in order to obtain NACA qualification or for NACA Credit Access to be granted. Likewise, 2017 tax returns will be required for all files in the NACA Home Save Program. Files in either program cannot move forward without the tax return after the 18th. For Taxes filed after March 18th where the 2017 transcripts (not returns) are not yet available, 2015 and 2016 transcripts are still acceptable. However, proof of 2017 filing (payment of taxes, tax return received or IRS stamp) will be required for files before they can go to a participating lender. For all other files, 2015 and 2016 IRS 1040 transcripts are required. Please note: Filing a Form 4868 (automatic extension of filing deadline) will not exempt NACA members from the above requirements. Also, failure to pay any taxes owed will also halt the progress of a file. Please contact NACA Member Services at 425-602-6222 with any questions. (February 15, 2018– Miami, FL) – More than 1000 home buyers attended the first day of NACA’s “Achieve the Dream” homeownership tour Thursday at the Miami Airport convention center. Nearly 200 were lined up at the door before the event opened at 8am, some arriving as early as 4am. Expectations are for attendance to be even greater on Friday, Saturday and Sunday. Low and moderate-income borrowers will have the unprecedented opportunity to obtain NACA’s Best in America Mortgage (No Down Payment, and No Closing Costs, and a Below Market Fixed Rate). Everyone who attends will work with a NACA counselor to be approved for the NACA Mortgage they can genuinely afford. NACA’s counseling is HUD certified and one of the nation’s largest counseling programs. This extraordinary event runs through Sunday, February 18th at the Miami Airport Convention Center (at the Double Tree Hotel) at 711 NW 72nd Avenue, Miami. Doors will be open from 8:00 a.m. to 8:00 p.m. each day. NACA has $13 Billion committed to the NACA Mortgage program and more than 60,000 homes have been purchased through NACA’s 47 offices, including Miami. NACA will also assist struggling homeowners at the event through its nationally acclaimed Home Save Program, through which more than 250,000 homeowners obtained an affordable mortgage. NACA’s Mortgage is the Best in America in that everyone receives the same truly extraordinary terms including no down payment, no closing costs (lender paid), no fees, no PMI, no credit score consideration, a below market fixed interest rate, interest rate buy-down, renovation funds and many other extremely favorable terms. About NACA (www.naca.com): NACA, Neighborhood Assistance Corporation of America, is one of the largest HUD certified non-profit counseling agencies with more than two million members. NACA is the largest and most effective organization in modifying mortgages, provides the best mortgage in the country, and is a tireless advocate for the rights of working people. NACA’s founder and CEO Bruce Marks is a nationally recognized leader in fighting for economic justice and has testified in Congress on numerous occasions. Marks was one of the first national leaders to sound the alarm in Congress of the pending mortgage crisis in 2000. For more information, go to www.naca.com. (February 5, 2018– Charlotte, NC) – On Tuesday February 6th at 11:00 a.m. at 600 East Fourth Street room 267, a press conference led by Mayor Vi Alexander Lyles, NACA’s CEO Bruce Marks, Bank of America representatives and Charlotte City Council members will announce the launch of NACA’s “Achieve the Dream” homeownership tour. This nationwide tour is to become the most important homeownership initiative in recent history. Low and moderate-income borrowers will have the unprecedented opportunity to obtain NACA’s Best in America mortgage (No Down Payment, and No Closing Costs, and at a Below Market Fixed Rate). This extraordinary event begins Thursday, February 8th through Sunday, February 11th at 5835 Executive Center Drive, Charlotte, NC 28212, in the Charlotte East Business Park. Doors will be open from 8:00 a.m. to 8:00 p.m. each day. Everyone who attends will work with a NACA counselor to be approved for the NACA Mortgage they can afford. NACA’s free of charge counseling is HUD certified and one of the nation’s largest counseling programs. NACA will also assist struggling homeowners at the event through its nationally acclaimed Home Save Program where over 250,000 homeowners obtained an affordable mortgage. NACA has $13 Billion committed to the NACA Mortgage and more than 60,000 homes have been purchased through NACA’s 47 offices, including Charlotte. Everyone approved receives the same terms including the below market fixed interest rate without consideration of their credit score or other factors. “This historic Achieve the Dream tour will provide one stop homeownership events where over four days one can be approved for the NACA Mortgage. NACA will continue these events with more than twenty events planned through 2018 providing unprecedented affordable homeownership opportunities to tens of thousands of working people nationwide” states Bruce Marks, NACA founder and CEO. “It is appropriate that the tour begins in Charlotte where Bank of America, NACA’s biggest partner is headquartered, and where NACA has strong support from the city”. NACA’s Mortgage is the best in America in that it contains terms that are truly extraordinary including no down payment, no closing costs (lender paid), no fees, no PMI, no credit score consideration, a below market fixed interest rate, interest rate buy-down, renovation funds and many other extremely favorable terms. NACA, Neighborhood Assistance Corporation of America, is one of the largest HUD certified non-profit counseling agencies with more than two million members. NACA is the largest and most effective organization in modifying mortgages, provides the best mortgage in the country, and is a tireless advocate for the rights of working people. NACA’s founder and CEO Bruce Marks is a nationally recognized leader in fighting for economic justice and has testified in Congress on numerous occasions. Marks was one of the first national leaders to sound the alarm in Congress of the pending mortgage crisis in 2000. For more information go to www.naca.com. All NACA Members currently in the NACA Purchase Program or Home Save Program who are W-2 wage earners must have their 2017 W-2 and 1099 forms submitted to their NACA file no later than Thursday, February 1, 2018. Likewise, completed 2017 tax returns must be in the file no later than this year’s filing deadline, Tuesday, April 17th. Files without completed tax returns on April 17 are also subject to suspension until documents have been submitted. This includes members who have filed a Form 4868, Application for Automatic Extension of Time to File. Atlanta has declared a State of Emergency due to snow and low temps. Public access to the building housing the Atlanta NACA office has been closed. Memphis will delay opening until 10:30am CST. Houston will delay opening until 2:00pm CST. These and other offices may also be subject to early closings. Please continue to monitor NACA’s social media channels for updates. We apologize for any inconvenience. GOOD MORNING! Weather issues continue to affect a few NACA offices this morning. Our #Buffalo and #Philadelphia offices will have late openings today. Until they are able to open, calls will be taken by NACA Member Services. Our #Baltimore office is experiencing electrical issues that may also affect operations this morning. Please continue to monitor NACA Social Media channels for updates.